If I have to name one podcast that’s made the most lasting impression in my life, I believe it has to be Expectations vs Agreements with Steve Chandler. In roughly 15 minutes he explains the difference between the two, according to his view, and when I first heard it it bowled me over completely. I had to listen again and again, and as a result of that, I took a long look at myself. I started to discover instances where my expectations were enormous, and non-spoken, and inevitably knocked me down, as my surroundings (or myself) never could live up to what I had dreamed up had to happen for whatever activity to become a success. Expectations, verbalized or not, will never get you above zero. If I expect something from you, and you don’t live up to it, I’m in the negative. If you live up to it, I get up to zero, because I expected you to. So I can never rejoice at it. Whereas if we make an agreement (and it has to be a proper one, where both parties takes it seriously enough to actually come to an agreement of what, when, how etc) I get to rejoice as much as I want to when we both live up to our respective tasks of the agreement. And I saw them. The expectation. They became very real to me then. The expectations in my mind were far from what was just happening. I had envisioned a lovely day, walking around in Copenhagen, having fun, enjoying ourselves, stopping for a bite to eat here or there, and generally having a day filled with Kodachrome-moments. Problem was. Those were my expectations. And as I could hear from the kids, they each had a complete other set of expectations. I never really got around to making an agreement with them that time, I think I basically flipped and told them off… Why should we ever go for a day-trip if all you’re gonna do is moan and groan? Didn’t win any awards for Mom of the Year for moment, that’s for sure. But we did have an ok day in the end, that we did! A while later me and the kids were going for a week-long break in Stockholm and Uppsala. On the train there, I told them about Expectations vs Agreements, and we talked about it. We voiced our expectations, and turned them into agreements, were we all were willing to give some, in order to get something else. And lo and behold, we actually had a great vacation together, where on numerous occasions we referred to our agreement, as a gentle reminder, and all of us were more generous with our time and moods. All of us, willing and wanting to pitch in a bit extra, knowing that it would, sometime, be returned to us. A great vacation that was, let me tell you! So. Try to spot when you fall in the trap of expecting this or that. Just noticing it makes a difference. If you want to, then start to experiment with starting a conversation instead, which might land you in agreement about what’s to be done, how, when, by whom and whatever other details might be necessary for your specific circumstance. Welcome to my humble abode, where the underlying tone centers around being gentle to oneself. 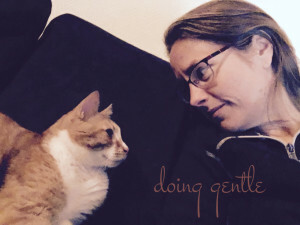 On Sundays I’ve been sharing thoughts on how I do gentle for the last 46 weeks, and I hope you’ve enjoy it. We are approaching December and I will be publishing an Advent Calendar daily, and who know’s if the Doing Gentle-series will be returning thereafter. Either way, if you like the perspective you get from reading my posts, please subscribe to updates so you won’t miss out on future posts.